In lieu of today’s Reality Check, please enjoy this special election issue of Friedman’s Weekly. This victory proves he – and the class of voters who elected him – cannot be overlooked. That is the reason Hillary Clinton lost. The Democratic Party that nominated her has moved far away from the party that Franklin D. Roosevelt crafted or that Lyndon B. Johnson had led. Their party had as its core the white working class. The liberalism of FDR and LBJ was built around this group, with other elements added and subtracted. Much has been said about this group having become less important. Perhaps so, but it is still the single largest ethnic and social group in the country. Donald Trump is the next President of the world’s oldest democracy. The US has elected the first man who has never held public office, as its Commander-in-Chief. It has declined to elect its first woman President. Now that a Donald Trump presidency is a reality from January 2017, it is worth asking what’s in it for America and the world. The Outsider has won. The Establishment has lost. The “deplorables” of the United States of America under the wayward leadership of Donald Trump, the renegade Republican who was disowned by many in his party, is the next President of the world’s oldest democracy. With nearly all US media houses calling it for Trump, pending any last minute miracle, it is now safe to say that the US has just elected the first man who has never held public office as its Commander-in-Chief. It has declined to elect its first woman President. Trump not only defeated Democratic nominee Hillary Clinton but the entire Left-Liberal media, the pollsters, a White House determined to stop him (from President Obama to his wife Michelle and Vice-President Joe Biden), Wall Street, Hollywood, the Democratic Billionaire’s Club, the Republican aristocracy and assorted critics from all over the world, especially Europe. But it was not Trump alone who did it. This vote has come from below, largely from the frustration of the white male voter who has been alienated from the elite. The white voter believes that party elites – both Democrat and Republican – have focused more on the minorities and the super-rich, leaving them high and dry. More important, Clinton’s expected women vote did not materialise. Not surprising, though, in hindsight. If the rust belt is angry, it hardly follows that the women of that belt will be unsympathetic to what their men care about. This is not only about the hullabaloo on the one-day ban on NDTV India and people shouting from rooftops about ‘freedom of speech’. To the irony of the country, similar minute by minute coverage went on for 60 hours during the 26/11 Mumbai terrorist attacks, to the joy of both the terrorists and their handlers in Pakistan; coverage including the photo-op of the then Home Minister how many NSG he was dispatching ex Delhi, when they would reach Mumbai, location and movement of our troops around the buildings occupied by terrorists, visuals of NSG boys slithering down helicopters and every other possible detail. It would be height of naivety to deflect this to mere hunger for TRPs. Little wonder then that Hafiz Saeed recently lauded select media of India so lovingly. Certainly we are not China but the holy cows chanting ‘freedom of speech’ might get high voltage shocks discovering the new cyber security law China has recently adopted against growing threat of hackers and terrorists – a law that that may even require foreign companies to hand over intellectual property to help security agencies in return for market access. China considered this law necessary despite China’s Great Firewall and indigenous operating systems. Critical information infrastructure operators would be required to store personal information and important business data in China and provide unspecified “technical support” to security agencies, in addition to the requirement of passing national security reviews. After the upgradation of Mechuka’s ALG, the giant Boeing C-17 could land. It should eventually ensure transport of men and material in the remote border village of West Siang district of Arunachal, which was invaded by the Chinese in 1962. In the consumer sector and in many other industries, transformation programs often fail. Creating a “performance infrastructure” can help ensure that yours won’t. Disruptive forces abound in today’s business environment. Technological innovation, regulatory changes, pressure from activist investors, and new entrants are just some of the forces causing disruption, even in historically less volatile business sectors. It’s therefore no surprise that many consumer-goods and retail companies are embarking on transformation efforts, sometimes in response to outside pressure and other times to get ahead of it. Regardless of why, these companies are introducing new ways of working to large numbers of employees, with the goal of producing a step-change, sustainable boost in business results. However, the painful reality is that most transformations fail. Research shows that 70 percent of complex, large-scale change programs don’t reach their stated goals. Common pitfalls include a lack of employee engagement, inadequate management support, poor or nonexistent cross-functional collaboration, and a lack of accountability. Furthermore, sustaining a transformation’s impact typically requires a major reset in mind-sets and behaviors—something that few leaders know how to achieve. As practitioners in Recovery & Transformation Services (RTS), a McKinsey unit focused on supporting turnarounds and transformations across industries worldwide, we’ve observed that the most difficult part of transforming performance isn’t determining what to do but rather how to do it. In this article, we discuss an often overlooked component of the “how” of transformation: the establishment of a performance infrastructure, made up of the people, processes, and tools that enable successful execution and sustainability of results. MANCHESTER, N.H. — The 2016 presidential race will be remembered for many ugly moments, but the most lasting historical marker may be one that neither voters nor American intelligence agencies saw coming: It is the first time that a foreign power has unleashed cyberweapons to disrupt, or perhaps influence, a United States election. And there is a foreboding sense that, in elections to come, there is no turning back. The steady drumbeat of allegations of Russian troublemaking — leaks from stolen emails and probes of election-system defenses — has continued through the campaign’s last days. These intrusions, current and former administration officials agree, will embolden other American adversaries, which have been given a vivid demonstration that, when used with some subtlety, their growing digital arsenals can be particularly damaging in the frenzy of a democratic election. The magnitude of this shift has gone largely unrecognized in the cacophony of a campaign dominated by charges of groping and pay-for-play access. Yet the lessons have ranged from the intensely personal to the geostrategic. The latest news and analysis of the candidates and issues shaping the presidential race. Sino-Pakistan ties create the threat of a potential two-front war. India thus needs to relook at its force structure. The PLAAF is the world’s second largest Air Force, with 2,500-plus aircraft. The PLAAF has been under aggressive modernisation. Combined with 450 aircraft of the PLA Navy, and the soon-to-be inducted state-of-the art aircraft carriers, makes it a great air power for the IAF to contend with. The IAF is down to 34 squadrons and reportedly at the bottom of the numbers curve. Prime Minister Narendra Modi’s very high profile fourth visit to USA in June 2016 brought the two largest democracies closer than ever before. Convergence of global strategic interests and US support to India for membership of Missile Technology Control Regime (MTCR) and Nuclear Suppliers Group (NSG) has been the lynchpin of the evolving relationship. End of the Cold War, by the early 1990s and the rise of China realigned the power centres. The international desire for dominance has now shifted to competing interests between the US and China. The Asia-Pacific region became the centre of global attention. Japan, Australia and India among many others are considered possible US allies to contain/compete with a rising China. For a few decades, China had been working towards dominating Asia. It considered India a regional competitor and therefore, tried to befriend India’s neighbours to encircle it and keep it ‘Head-Down’. One key element in the Dragon’s game-plan, often termed as the ‘String of Pearls’ strategy, was Pakistan. China used Pakistan’s strategic insecurities to offer military and economic support. Hidden behind this was China’s own desire to find shorter logistic routes to the oil-rich Middle East and the still waiting-to-be-exploited markets of Africa. China’s strategy has been unequivocal. 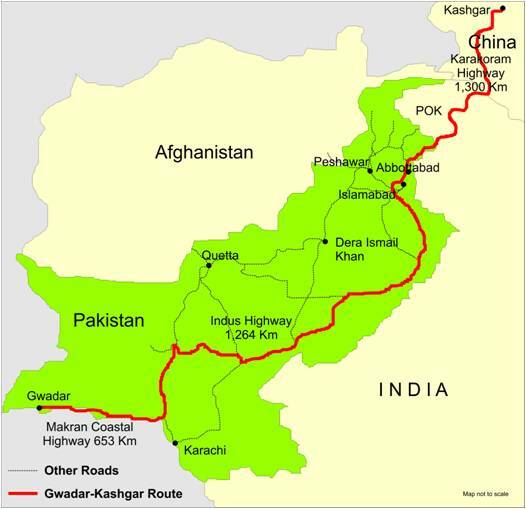 In return for economic support, military hardware and know-how, Pakistan ceded to China, 5,180 sq. km. of territory in Pakistan Occupied Kashmir in the Karakoram. India’s Prime Minister Narendra Modi has claimed that his government has brought back Rs. One lakh crore of black money . It is reported that this, Rs. 36000 cr. was by preventing the siphoning of funds by the intermediaries, by the introduction of direct benefit transfer scheme. The other Rs. 65000 cr. of black money was by launching tax amnesty scheme and other measures. The Prime Minister has further said in his inimitable style that this has been done “without launching surgical strikes”. While the Prime Minister makes such claims, the common man still feels that there is no visible and effective fight against corruption in the country, as there is no visible reduction in the level of corruption at various levels in the government machinery , amidst the business houses and even educational institutions and hospitals. Mr. Modi was voted to power as Prime Minister of India largely on the expectation that he would fulfill his promise to root out corruption in the country at all levels within a stipulated period. The fact is that this has not been done it yet ,though he is making efforts in variety of ways. It does not look that corruption in India would be rooted any time sooner. One cannot see any fear of law generated amongst the government employees and business houses and even among educational institutions and hospitals about indulging in corruption and tax evasion. The world has two big poor countries: China and India. Since World War II, they have had rulers focused on putting poverty behind and making their countries prosperous. Till the 1980s, neither had found the key to growth: China went through a long, painful ideological war; India's ambitious government had poor mastery of economics and kicked the economy into one crisis after another. When I was taken into that government in the early 1990s, I thought that the controls on India's external economic relations had to be removed if we were to avoid crises. That happened to some extent over the next few years. The economy was opened up, and we have not had an external crisis since 1991; even if the government tried today, it could not have one. But I was removed soon, and those who then ran the government did not find the key to steady, rapid growth. As a result, China grew enormously faster than India. In 1989, India's per capita income was $1100 and China's $900 at the same prices; India was 22 per cent richer. In 2015, the figures were $6265 and $13801; China was two-and-a-quarter times as rich as India. It saddened me, but at least I was relieved that I had no responsibility for our miserable performance. Denis Medvedev was the World Bank's India economist for three years; he went back recently to become a lead economist in the Innovation and Entrepreneurship unit of the Trade and Competitiveness Global Practice. As a farewell gesture, he and his colleagues did a report claiming that it was now South Asia's turn to lead global growth, and proposing policies that would turn it into the next export powerhouse. It is a long time since someone had the vision and the insight to propose something ambitious for India. Medvedev's team covered South Asia; here I will confine myself to India. Have the Western Powers Decided to give up Afghanistan to the Taliban? I have been following the situation in Afghanistan for the last many years and I have written papers on the developing situation in Afghanistan from time to time. For the last few years, I had an uneasy feeling that the Western powers were going to concede the ground situation in Afghanistan to the Taliban. This feeling was confirmed after the surprise attack on Kunduz by the Taliban a year ago, when they overran the town. I think, that was a turning point, when the local people, who did not want an extremist group like the Taliban ruling them, lost confidence that the government could protect them. Pakistan’s role in the Afghan Insurgency. It is not that the West has reduced the aid to the Afghan Government. The Afghan Government has received one of the highest amounts of foreign assistance per capita on a par with the West Bank, Gaza and Liberia. The United States alone has spent five hundred billion dollars on its Afghanistan mission since 2002, most of it on military operations. About a fifth of this amount — one hundred and thirteen million dollars was on reconstruction. Yet, Afghanistan remains one of the poorest countries in the world — more than ten million people live below the poverty line and three quarters of the population is illiterate, according to the World Bank. In the beginning when operations started against the Taliban and the Al Qaeda, they fled in disarray. Thousands of both the Taliban and Al Qaeda fighters surrendered in Northern Afghanistan. They had lost the support of the local population. All of them fled to Pakistan and there, they were allowed to regroup and the Pakistan Army trained the young Afghan men, in how to make pressure cooker bombs, filled with ball bearings and suicide belts and later truck bombs and sent them back to Afghanistan by the hundreds. Despite years of denial by Pakistan, it is now widely understood that the Taliban has all this time been mentored and equipped by the Pakistan ISI. Yet the United States has failed to end Pakistan’s long flirtation with the Taliban and the Al Qaeda. Nearly a quarter of Afghanistan’s districts are under the control of the Taliban. Pakistan’s powerful army and Intelligence services have for years given support to the Taliban and the Haqqani terrorist network and relied on them to protect Pakistani interests in Afghanistan and prevent India from increasing its influence there. Pakistan should have been militarily contained decades back but then successive Indian Prime Ministers from Nehru to even present PM Modi until recently, adopted flawed policy of ‘Engagement with Pakistan’ through direct unilateral initiatives, Track II dialogues and Special Envoys. Pakistan’s unrestrained conflict escalation with India has not matched India’s efforts for peace and reconciliation with Pakistan for the last seven decades. Geopolitically the time is now ripe for India to shed its enfeebling policy of ‘Strategic Restraint’ and ‘Risk Aversion’ when it comes to taming Pakistan’s strategic delinquencies arising from borrowed external strengths. All along, Indian National Security Advisers have viewed the Pakistan Army challenge to India in political terms and not in stark military perspectives. There are no political options to tame the Pakistan Army. This has distorted the pace of India’s war preparedness and creation of appropriate military force structures. Pakistan’s India-centric military confrontation during decades under United States strategic tutelage had a somewhat strong temperance factor imposed by America. The picture drastically changed since 2010 when Pakistan emerged as ‘Front Line State of China’ while still lingering with a double-timing of the United States. China cannot be expected to impose temperance on Pakistan when both have an anti-India strategic convergence. The US military says that the Taliban “influences” at least 25 of Afghanistan’s 407 districts and controls only 8 more. The numbers are at odds with an assessment by The Long War Journal of Taliban control in Afghanistan. The US military’s estimate does not explain how the Taliban is able to support multiple concurrent offensives across the country and threaten five provincial capitals. The US military’s estimate of Taliban control and influence of Afghan districts was reported by the Special Inspector General for Afghanistan Reconstruction, or SIGAR, in its quarterly report to Congress that was released on Oct. 30. The data are current as of Aug. 28, 2016. “[O]f the 407 districts within the 34 provinces, 258 districts were under government control (88 districts) or influence (170), 33 districts (in 16 provinces) were under insurgent control (8) or influence (25), and 116 districts were ‘contested,’ SIGAR noted, based on discussions with US Forces-Afghanistan, or USFOR-A. Can America Remain a Pacific Power? This article was created in collaboration with the Wilson Center. Shihoko Goto is the senior associate for Northeast Asia at the Woodrow Wilson International Center for Scholars. Michael Kugelman is the senior associate for South and Southeast Asia at the Wilson Center. The views expressed here are the authors' own. Through his tough talk and shrill rhetoric, the president of the Philippines is giving voice to deep concerns quietly harbored by other leaders in the Asia-Pacific. Rodrigo Duterte, the Philippines’ shoot-from-the-hip president, has generated headlines for his withering and often profane anti-American views. He routinely insults the United States, and in recent days has suggested that such strident sentiment could translate to policy shifts. On Oct. 21, Duterte, speaking in Beijing, threatened his country’s “separation” from its long-standing alliance with the United States (a threat he later walked back somewhat). Then, on Oct. 26, this time speaking in Tokyo, Duterte called on U.S. troops to withdraw from his country within the next two years. Such a move would jeopardize a bilateral mutual defense treaty that is a cornerstone of the U.S. defense umbrella in Asia. Coming from a leader in a region where the United States enjoys more friends than foes, this is all quite unsettling. Yet Duterte is not necessarily an anomaly. 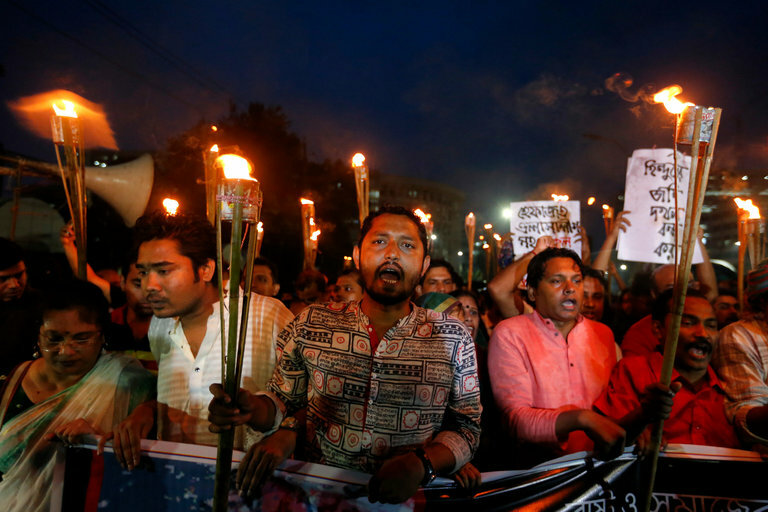 DHAKA, Bangladesh — Vandalism and arson directed at Hindu temples and homes continued over the weekend in Bangladesh, as crowds in various parts of the Muslim-majority country appeared to target its largest religious minority group. Many of the acts were minor. Late Saturday or early Sunday, for instance, Hindu idols were defaced in temples in the north and south of the country, according to the police. But Hindu communities are increasingly unnerved, said Anjan Kumar Deb, the vice chairman of Nasirnagar subdistrict, northeast of Dhaka, the capital, where an angry Muslim crowd ransacked 15 temples and scores of homes on Oct. 30. Fifty-three people have been arrested in connection with those crimes. India expressed “grave concern” over the attacks, with Sushma Swaraj, the external affairs minister, instructing Delhi’s ambassador to the country to visit the prime minister of Bangladesh, Sheikh Hasina. 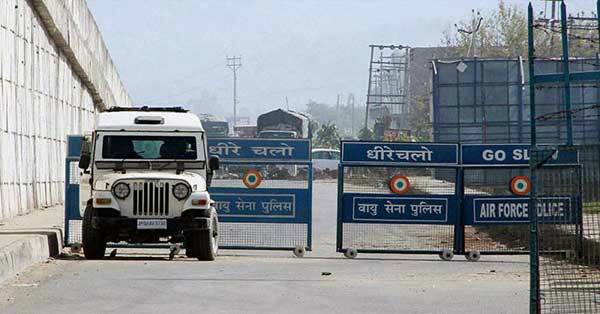 The violence in Nasirnagar, whose population is about 40 percent Hindu, was set off by a Facebook post published by a Hindu youth. The post included an image of the Hindu god Shiva appearing at a Muslim holy site in the Saudi city of Mecca. Mr. Deb, a Hindu community leader, received a call on Saturday that unknown people had built a fire on the veranda of his home. “The attackers want to create a panic among Hindus,” Mr. Deb said, adding that the campaigns may aim to strip Hindus of their lands. In the first part this paper, it was sought to analyse Chinese perceptions, possibilities of a new world order centred on China, and its military and naval aspirations. In the second part of the analysis, the role of the Chinese in the growth of communist regimes and how the secret service in China aided that was examined. Successful cyber warfare as a key ingredient of their strategic play formed a part of the analysis. Finally the correlation of spreading Islamic fundamentalism and China and its impact on India was looked at. China’s ascendance as an economic powerhouse and military superpower has started altering the cultural, political, social, and ethnic balance of global power and is in the process of creating a whole new world. According to conservative estimates, China will overtake the United States as the world’s largest economy by 2027 and will ascend to the position of world economic leader by 2050. But the full repercussions of China’s ascendancy have been little understood. Answers to some of the most pressing questions about China’s growing place on the world stage can be understood by looking at how China will seek to shape the world in its own image. The Chinese have a rich and long history as a civilization-state. Ninety-four percent of the population still believes they are one race, the Han Chinese. The strong sense of superiority finds a resurrection in twenty-first century China. This is also used to strengthen and further unify the country. A culturally self-confident Asian giant with a billion-plus population, China will resist globalization as we know it. This exceptionalism will have powerful ramifications for its neighbours. As China is already cementing its position as the new centre of the East Asian economy, the mantle of economic and, therefore, cultural relevance will pass from Manhattan and Paris to Beijing and Shanghai. The relationship and attitude toward China will affect India’s peace. Therefore an attempt has been made to explain the upheaval that China’s ascendance will cause and the realigned global power structure it will create directly affecting India’s policies on economy, oil and its relations with the US. ** Is the Growing Pessimism About China Warranted? There are few more consequential questions in world affairs than China’s uncertain future trajectory. Assumptions of a reformist China integrated into the international community have given way in recent years to serious concerns about the nation’s internal and external direction, as China has become more repressive at home and more assertive abroad. A number of critical variables will shape China’s evolution: the political orientation of the regime, needed economic transitions, social stability and civil society, national identity and historical legacies, diplomatic relationships, and the broadening footprint of the military. In a special symposium of articles just published in The Washington Quarterly, five leading China specialists have weighed in on these issues: David M. Lampton, David Shambaugh, Minxin Pei, Orville Schell, and Jeffrey Wasserstrom. These long-time China hands unpack the complexities and uncertainties, explore the forces shaping China’s future, and offer several alternative pathways the regime and nation may follow in the years ahead. Is the growing international pessimism about China’s internal and external behavior warranted? China’s military is developing ships, submarines, aircraft, intelligence systems and foreign bases in a bid to become a global military power, according to a forthcoming congressional China commission report. The late draft of the annual report by the US-China Economic and Security Review Commission contains a chapter on Beijing’s power projection development and warns that once fully developed, the weapons and forces could contribute to a regional conflict in places like the South China and East China seas. “China is building military capabilities to deal with hostile air, surface, and subsurface operational environments in the ‘far seas,’” the report states, noting that the operations expand the focus beyond the two island chains off China’s eastern and southern coasts. People’s Liberation Army to conduct a range of externally focused operations, to include combat insertion, island landing operations, humanitarian assistance/disaster relief operations, noncombatant evacuation operations, and peacekeeping missions,” states the report. The United States has been quietly and steadily expanding its military footprint in Iraq since ISIS overran swathes of the country in 2014. A contingent of 300 troops was deployed to defend Baghdad in the aftermath of the ISIS offensive and that number has grown ever since. Even though the Pentagon claims the majority of the troops have been training and advising Iraqi security forces and Kurdish Peshmerga forces, American units are now finding themselves closer than ever to the front lines. American special forces have been conducting offensive operations against the militants for years and by October 2014, Apache attack helicopters were also sent into action near Fallujah. By the summer of 2015, U.S. artillery was operating on the ground with the number of military personnel in the country reaching 3,500. As the Iraqi army and Kurdish Peshmerga forces prepared for the assault on Mosul, President Obama announced that a further 600 U.S. troops would be sent to Iraq, taking the number deployed there passed the 5,000 mark. That's a fraction of the 170,000 deployed at the height of the Iraq War in 2007 but it's still solid evidence of mission creep. Just last week, a member of the U.S. Navy was killed by an improvised explosive device in northern Iraq. The reality of the situation is that American soldiers are fighting and dying once again on the ground in Iraq with casualties likely to increase even further in line with the expanding military presence. This chart shows the number of U.S. armed forces personnel in Iraq. BEIRUT, Lebanon -- As Iraqi forces tighten the noose around the Islamic State-held city of Mosul in northern Iraq, they face a cun­ning and murderous foe who has had two years to dig in and is fight­ing back with a ferocious campaign of scorched-earth tactics, suicide bombers, toxic sulphur-laced clouds, a morale-sapping cyber campaign and high-grade bombs, some of them assembled by slave labor, that could remain a danger for years to come. The Islamic State's ordnance production is no longer restricted to a small cadre of bomb-makers, veterans of the jihadist wars, but is run on what military experts say is an industrial scale. Iraqi and Kurdish officials say this has been achieved through a network of factories using some of the thousands of slaves IS has amassed since 2014 when it seized one-third of Iraq. "Islamic State went through its own industrial revolution," ob­served Emmanuel Deisser, director of Sahan Research, a British-based security think tank hired by the security council of Iraq's semi-au­tonomous Kurdish region to ana­lyze the bomb threat of the Islamic State. "It got a workforce to produce a seemingly endless high-quality stream of death machines and im­provised explosive devices," he told the Financial Times. It is estimated that between 27,000 and 31,000 foreign fighters have flocked to Iraq and Syria since the breakout of the war in 2011. An updated assessment of the flow of foreign fighters into Syria and Iraq shows that there is a significant increase in the number of foreign fighters travelling to Syria. Data provided by the Soufan Group in 2014 estimated that the identifiable number of foreign fighters is approximately 12,000 from 81 countries. It was also believed that the number of foreign Jihadists coming form Western countries does not exceed 3,000: “Around 2,500 are from Western countries, including most members of the European Union, the United States, Canada, Australia, and New Zealand”, according to Soufan’s initial report on Foreign Fighters in Syria. Now the number exceeds 27,000 foreign fighters from at least 86 countries. While the accurate numbers of foreign fighters in Syria are difficult to verify, and so are the numbers of them coming back to their home countries, the CIA spokesman Ryan Trapani said: “This new total reflects an increase in members because of stronger recruitment since June  following battlefield successes and the declaration of a caliphate, greater battlefield activity, and additional intelligence”. The Soufan Group said that “despite sustained international effort to contain the Islamic State and stem the flow of militants traveling to Syria, the number of foreign fighters has more than doubled”. This shows that the impact of these increased efforts to contain the flow of foreign recruits to extremist groups in Syria is limited. For all the unique and strange precedents set by this election, few could have foreseen that a new stage in cyber conflict would be one of them. In the lead-up to election day in the US, officials are scrambling to signpost that any cyber attack that affects the election could result in a proportional response from US cyber agencies. Whether these warnings succeed in warding off an attack will have a significant impact on the future of conflict in cyberspace between states. Since cyberspace has become a more pressing security issue over the last decade, governments and national security experts have continuously expressed concern over the vulnerability of critical infrastructure. The security of electricity grids, nuclear power stations, dams and other hardware was (and still is) thought to be the most urgent issue for cyber security officials. 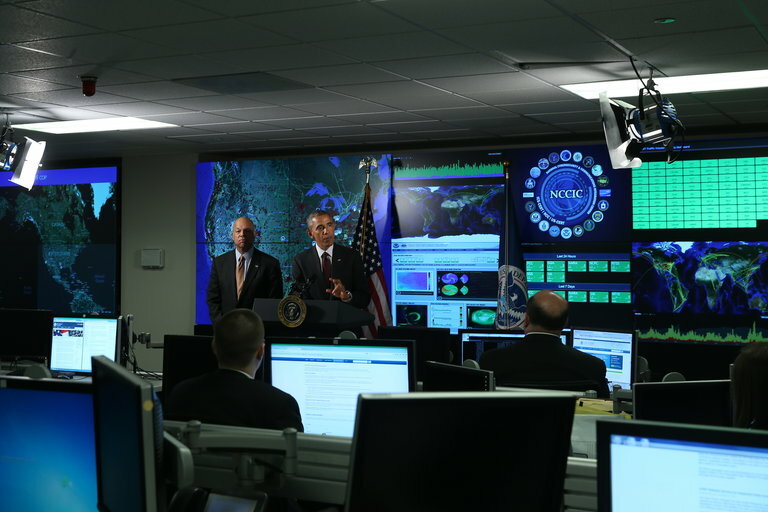 However, this election has revealed a new front in the way cyber conflict is evolving. Many governments have declared that any cyber attack on their country’s critical infrastructure would amount to an act of war; this is a relatively clear line and signal for other states. But the grey zone that has emerged, and that opponents of the US are trying to exploit, is the ability to influence, discredit or manipulate political opinion and democratic processes. This has been playing out in real time for those that have been watching the US election, with the method favoured so far being the hacking and releasing of private emails. The hacks against the Democratic National Committee and subsequent leaking to Wikileaks have been the most prominent. The timing of those leaks, right before the Democratic National Convention, was intended to cause maximum disruption and damage; the chairwoman, CEO, CFO and communications director of the Democratic party all resigned in the wake of the leaks. Russian interventions in Ukraine and Syria have frustrated Western analysts’ efforts to identify the tactical and strategic bases of a new form of “hybrid warfare” utilizing non-military assets in conjunction with conventional and nonconventional military operations. [i] Various commentators have expressed dissatisfaction with this description, however, asserting that recent Russian military activity does not reflect widely accepted definitions of hybrid warfare relating to irregular conflicts involving both state and sub-state actors such as the 2006 war between Israel and Hezbollah. [ii] Some analyses have questioned whether or not the current Russian model is even a new form of warfare at all, proposing that it more accurately reflects operational concepts of Soviet origin. [iii] This uncertainty has led to a proliferation of new definitions for these Russian “hybrid” operations, including such terms as ambiguous warfare, grey warfare, non-conventional warfare, political warfare, and new warfare. [iv] Such is the confusion surrounding these Russian interventions that one leading analyst has expressed his preference for the term “non-linear warfare” on the grounds that it means almost nothing at all. [v] It is generally agreed, however, that some sort of comprehensive description encompassing recent Russian military operations needs to be established, as the nature of a threat must be identified and understood before any effective response to it may be formulated. [vi] This paper therefore proposes an alternative definition of Russian “hybrid” activities that is derived from the Russian concept bespredel, commonly translated as “[the] absence of limits.” The use of this expression will redress the most significant criticisms of the current theoretical language concerning these operations while also demonstrating the efficacy of the term as applied to this context. By conceptualizing Russian “hybrid” activities in terms ofbespredel, a more nuanced understanding of the myriad threats and capabilities associated with these operations will be realized, not least of which is an appreciation of the ruthlessness inherent to this system of warfare. How does misinformation spread online? In the run up to the 2013 Italian elections, a social media post exposing the corruption of parliament went viral. Italian politicians were quietly certain that, win or lose, they would be financially secure by taking money from the taxpayer. Parliament had quietly passed a special welfare bill specially designed to protect policy-makers by ensuring them an incredible unemployment package should they lose their seat in the upcoming election. The bill, proposed by Senator Cirenga, allocated an amazing €134 billion to political unemployment. The Italian Senate had voted 257 in favour and 165 in abstention. The post caused considerable and understandable uproar. It was covered in several leading newspapers and cited by mainstream political organizations. But there was one problem: the entire story was fake. Not even a good fake at that. For those interested in Italian politics, there were a number of obvious problems with the story. First of all, there is no Senator Cirenga. The number of votes doesn't work either, because Italy doesn't even have that many senators. And the incredible sum would have accounted for roughly 10% of Italy's GDP. So what happened? How did such an obvious fake fool so many people? Even good managers can miss the early signs of distress, says McKinsey’s Doug Yakola, who’s been running recovery programs for 20 years. The first step is to acknowledge there’s a problem. “I’ve seen my share of boiled frogs,” says Doug Yakola, comparing companies in crisis with the metaphorical frog that doesn’t notice the water it’s in is warming up until it’s too late. As the chief restructuring officer or CFO of more than a dozen turnaround situations over nearly two decades, Yakola has witnessed firsthand how managers back right into a crisis without recognizing that their situation is worsening. “They’re not bad managers, but they’re often working under a set of paradigms that no longer apply and letting the power of inertia carry them along.” And if they don’t realize they’re facing a crisis, they won’t know that they need to undertake a turnaround, either. McKinsey’s Doug Yakola reflects on nearly two decades of leading companies through crisis. He’s also heard the regrets: sometimes managers underestimated how critical their situation was—or they were looking at the wrong data. Others took advantage of easy access to cheap capital to stay the course in spite of poor performance, believing they could push through it. Still others got so caught up in the pressure for short-term returns that they neglected to ensure their company’s long-term health—or even willfully sacrificed it. Rare among them is the executive who stepped back to review his or her own plans objectively, asking “Is this what I thought would happen when I first started going down this road?” That’s a problem, Yakola says, because acknowledging that your plan isn’t working is a necessary first step. Yakola joined McKinsey’s Recovery & Transformation Services as a senior partner in 2011. Here, he offers ten ways ailing companies can get started on the turnaround work they need. We will respond in a time and place and manner of our choosing, and when we do so, we will consider a full range of tools, economic, diplomatic, criminal law enforcement, military, and some of those responses may be public, some of them may not be. To be fair, Earnest was correct when he lamented last week that “the rules of the road when it comes to cybersecurity in large part are not well-established, and that makes it difficult” to devise a response to state-sponsored cyberattacks. Yet the problem runs much deeper than awkward press briefings. Despite the broad consensus regarding the threat malicious cyber activity poses to U.S. interests, the United States has failed to articulate or formulate a successful strategy for cyber conflict.